Concentrating solar power could unlock our clean energy future and boost solar from an intermittent contributor to a baseload generator. Concentrating solar power (CSP) could unlock our clean energy future and boost solar from an intermittent contributor to a baseload generator – if we clear the regulatory, technological, and financial hurdles standing in the way. “Fulfilling the Promise of Concentrating Solar Power,” a new white paper from the Center for American Progress (CAP), estimates CSP could add up to 16 gigawatts of baseload power globally within a few years, with a larger return on investment and smaller environmental impact than most other energy technologies. However, significant challenges face this potential panacea for energy and climate concerns. Good thing, then that CAP’s paper outlines low-cost policy solutions to reduce financial risk, promote investment, and drive innovation in CSP technology. Could Concentrating Solar Power Save Humanity? CSP technology has been called “the technology that will save humanity.” While that may be a grand statement, CSP could meet up to 7% of the world’s projected electricity needs in 2030, and 25% by 2050, according to CAP. California’s SEGS power plants were the first to demonstrate utility-scale CSP power starting in the 1980′s, and currently produce 310 megawatts (MW) of electricity at 5.57 cents per kilowatt hour (kWh) – enough to cheaply power 250,000 homes. In addition, Arizona’s Solana plant and California’s Ivanpah project will soon come online and produce more than 600MW of reliable power. These attributes mean the 2.5GW of electricity currently generated worldwide by CSP and 2GW under construction can be viewed through the same energy-production lens as fossil fuel generation. When environmental and economic benefits are added, CSP’s superiority over fossil fuels and other renewables really come into focus. CAP notes that CSP plant components are largely sourced from common materials like steel and glass, unlike solar PV panels, which depend upon rare earths and volatile global supply chains. CSP also uses less land per MW than any other form of renewable energy, producing 1.5 to 3 times more power per acre than solar PV, and the same amount of land as fossil-fuel generation when mining and production requirements enter the equation. Combining free and abundant power from the sun with energy storage also boosts CSP’s economic outlook. A report from the National Renewable Energy Laboratory (NREL) estimates investing in 100MW of CSP generates 4,000 job years and $628 million in economic output – compared to 330 job years and $47 million in economic output for an identical investment in natural gas. 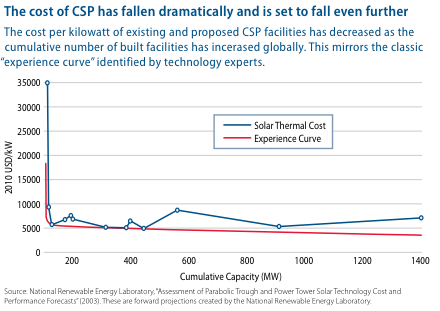 CSP is also cheaper than coal when considering emissions. 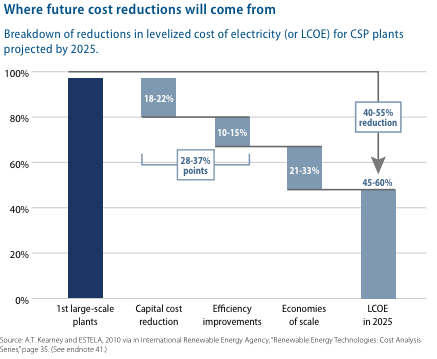 A conservative estimate predicts by 2015, sequestering 1 metric ton of carbon dioxide from a coal plan will be three times more expensive than generating the same amount of electricity from CSP. These attributes are already making CSP electricity cheaper than fossil fuels. CAP notes that CSP power in California is as low as 12 cents per kilowatt-hour (kWh) compared to 19 cents per kWh for natural gas, and NREL estimates every 1% of efficiency improvement reduces CSP costs 7% No wonder a 70MW CSP array has been added to an existing Florida natural gas power plant to boost production and environmental performance. Significant financing costs created by investor risk perception which drives higher loan interest rates. Unnecessary exposure to price volatility via fossil fuels driving regional electricity markets. Undervalued climate benefits due to the lack of a national price on carbon. Higher upfront capital costs than fossil fuel projects. Complex review process stemming from overlapping regulatory authorities. Lack of sufficient transmission access for potential projects. Haven’t I Heard These Before? The obstacles facing CSP aren’t new; in fact they’re similar to many of the energy problems we face today. What’s different, however, is the presence of multiple realistic solutions. Maintaining existing federal policies like loan guarantees, regulatory fast tracking, research and development programs at national labs, manufacturing and investment tax credits, and state-level policies like net metering and renewable energy standards. Establishing an independent clean energy deployment bank. Reinstating DOE’s loan guarantee program for CSP projects. Establishing a price on carbon through cap and trade or carbon tax. Leveling the tax-break playing field for CSP and fossil fuel. Guaranteeing transmission interconnections for solar projects on public lands. Add it all up, and we’ve identified a proven source of baseload power that could meet a massive portion of our electricity needs, with some of the smallest operational costs and environmental impacts of any energy technology. But, since Congress stands in the way, maybe we shouldn’t hold our breath.